As of late, I have dumped Sephora for The Body Shop. Their products just work perfectly for me. I have not bought anything from Sephora in a few months, so I went yesterday to see what was knew. They had some things I had been wanting to try for a few weeks, so I finally picked them up. 1.) 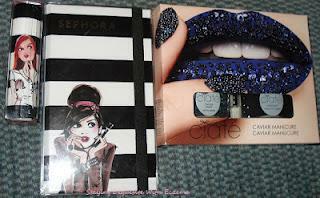 Ciaté Caviar Manicure set in Black Pearls. I looked and looked for small glass beads at my local craft stores, but could never find any that were small enough or did not have a huge hole in the middle. 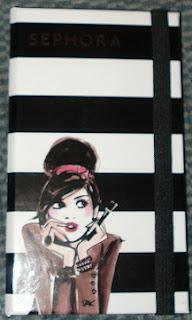 I'm getting read to try it out after this is posted :) I am sure that I will find some way to mess it up, lol. 2.) Sephora by Izak Satin Kiss Twin Lipstick in Coquette. The packaging for these new products is so adorable! 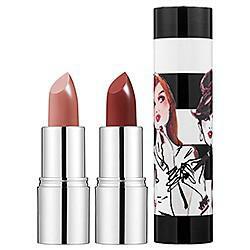 It comes with two mini lipsticks encased in a cute tube. I will go into more detail on my review post, but I did apply some last night and they felt creamy and soft. Source: sephora.com via Kristen on Pinterest3.) 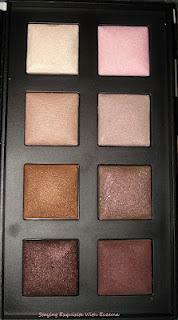 Sephora by Izak Baked Eyeshadow Palette. Again, cute packaging, nice everyday colors and finally, shadow from the Sephora Collection that feels soft. It is sad how happy that makes me. Anyhow, they also seem to be nicely pigmented. I'm also expecting some new goodies to be delivered from The Body Shop today. Why, oh why, must they have such good sales? Plus I had $25 because of my 8th purchase and having a "Love My Body" card. So expect a post on that a little later as well as one on the results of my manicure. And the best friend and I are thinking of adding some color to our hair by using the soft pastels that are so popular. And I am almost embarrassed to say, this will be the most "wild" and outlandish thing I have ever done. This is one shade from the lipstick duo, the lighter shade did not photograph well.